where the need is great. Christmas day can still be a time of feasting and abundance with only the gift itself being different. It is a joyful and fulfilling experience to sit together on Christmas day and to take turns speaking about your chosen beneficiary. This helps everyone to understand the positive impact created by each tithe. Give your entire Christmas budget. Donate an equal amount of money to organizations as you have spent on gifts. Spend less on presents and tithe the remainder. Buy one present each as a "Kris Kringle" exchange with your family, and jointly tithe to something you all care about. Suggest a present that your family can buy "for you" that you can then pass onto the organisation of your choice; i.e., dog baskets for an animal shelter. Ask your family and friends who choose not to tithe, to give you money instead of a present, so you can tithe it yourself. Inspire your company to tithe some of their Christmas party money to a worthy cause. This year I invite you to join me in experiencing Christmas differently. I have observed that we already have abundance in our lives, so I am going to be donating my present budget to an organisation that is enriching the lives of those less fortunate than ourselves. This Christmas my gift arrives to you in the form of (insert description). As we already experience abundance in our lives, I have chosen this gift because it creates change where it's needed. 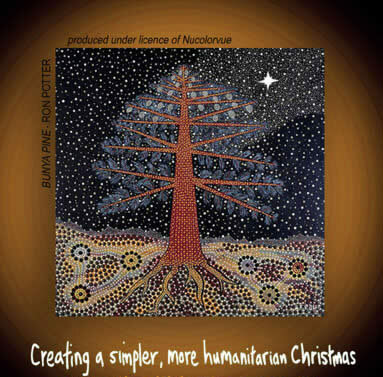 Together we are creating a simpler, more humanitarian Christmas. "Presenting your present when there is no present to present ..."
Most Grateful for this Inspiration! If so inspired, you may consider a Tithing Tree donation to SouledOut.org to assist with our ongoing ministry through this website. We very much appreciate your participation and consideration.